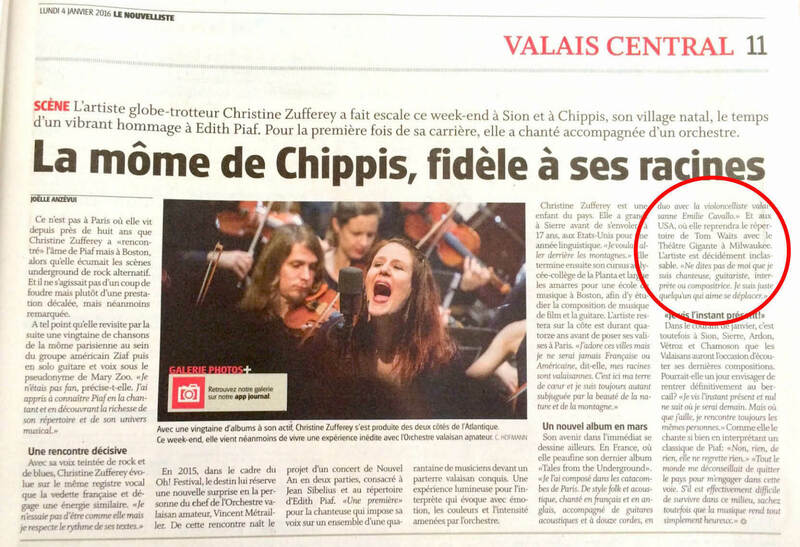 The Swiss newspaper Le Nouvelliste recently brought its attention to Parisian singer Christine Zufferey and Theatre Gigante’s upcoming production of WOYZECK, to be presented in Kenilworth 508 Theatre March 4-12, 2016. Theatre Gigante’s acclaimed production of WOYZECK brings Christine back to the Gigante stage to perform the evocatively beautiful songs written by Tom Waits & Kathleen Brennan which, interlaced throughout the story, underscore the poetic nature of this WOYZECK, written by George Büchner and adapted for Gigante by James Butchart. Here, Christine’s powerful voice lends itself well to the hypnotically charged music of Waits & Brennan, and she will perform it with Gigante regular Frank Pahl, a brilliantly innovative musician from Ann Arbor, who, as Music Director of the production, will display his talents on various instruments, including those self-devised and made. Gigante audiences will remember Christine performing on Gigante’s Studio Series in February 2015, and Frank, who performed with his scintillating Little Bang Theory on the same Series in July. Gigante is thrilled to welcome both back as part of WOYZECK! Follow this link to more information about Gigante’s WOYZECK.